Sinclair, Hugh. Confessions of a microfinance heretic : how microlending lost its way and betrayed the poor. Berrett-Koehler Publishers, 2012. Microfinance pioneer and Nobel Peace Prize winner Muhammad Yunus was the commencement speaker at Duke University in 2010 and he has been involved with Fuqua’s Center for Social Entrepreneurship since 2004. The renowned “Banker to the Poor” has been one of the most successful social entrepreneurs of our time, beginning in 1976, when he loaned $26 to 42 women in rural Bangladesh to enable them to purchase bamboo to make and sell stools. In 1983, he founded Grameen Bank to provide similar loans on a larger scale. Soon after, international NGO’s with missions to serve the poor added microfinance programs as a simple and effective way to break the cycle of poverty. In a new book, Confessions of a Microfinance Heretic, author Hugh Sinclair agrees. Using his experience over 10 years with several MFI’s, he shows that what began as a good idea has been hijacked by large investors and banks. In this fly-on-the-wall account, Sinclair begins his story in 2002 as a new MBA graduate from IESE in Barcelona, who accepts an offer as a consultant with an MFI in Mexico. At the time, the industry is small, but through Sinclair’s daily interactions with executives, coworkers and clients at various MFI’s over the next decade, Sinclair shows how shady practices emerge as the sector grows and changes into the modern $70 billion microfinance industry. His story illustrates a wide range of problems. As currently practiced, microfinance is ineffective and most loans are made to buy consumer goods or to repay another loan. Interest rates are usually over 30%. Children are pressed into labor to repay the loans. Borrowers are not protected in their unregulated economy. Sinclair concludes that profit incentives and lack of oversight allow most MFI’s to ignore the negative impact they have on poverty. This engaging book is recommended for anyone interested in emerging markets or social entrepreneurship. Boyd, Roddy. 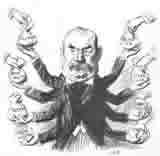 Fatal Risk: a cautionary tale of AIG’s corporate suicide. Wiley, 2011. Hudson, Michael W. The Monster: How a gang of predatory lenders and Wall Street bankers fleeced America and spawned a global crisis. Times Books/Henry Holt and Co., 2010. It is fair to say that the average American does not understand what caused the global economic crisis. The sub-prime mortgage industry played a major role, but did not cause the meltdown by itself. Financial innovations, such as CDOs, CMOs and CDSs, also contributed. To explain what spawned the global meltdown to those without an MBA, two engaging new books use the stories of companies and their managers. 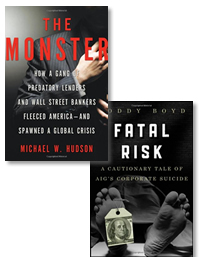 In Fatal Risk, Roddy Boyd tells the story about AIG, a company whose management analyzed and modeled risk better than anyone else in the financial business yet ended up needing an $85 billion government bailout. In The Monster, Michael W. Hudson covers the sub-prime mortgage business through the stories of Ameriquest and Lehman Brothers. Fatal Risk: From 1962 CEO Hank Greenberg built AIG into the largest and most risk averse financial company on the planet by knitting together a collection of insurance companies from around the world. Then in 1986, seeking additional growth opportunities, Greenberg raided Drexel Burnham Lambert and launched AIG Financial Products, entering in the market for equity options and derivatives. Even before CEO Greenberg was forced out in 2005, management changed its focus from risk control to profit maximization. New management leveraged the business, scrapped the internal controls and ruined the company, nearly bringing down the global financial system in the process. Roddy Boyd has written a very readable chronicle about a complicated subject. The Monster: The sub-prime industry was spawned in Orange County CA, home to four of the nation’s six largest sub-prime lenders. This is a story of Ameriquest Mortgage, the leader in the sub-prime industry, and about its CEO Roland Arnall. The methods used by Ameriquest and other sub-prime lenders to make loans to unqualified borrowers included falsifying documents, forging signatures, misrepresenting interest rates, inflating appraisals and charging exorbitant fees. These loans were bundled and sold on Wall Street to unsuspecting investors by firms such as Lehman Brothers, which bankrolled lenders such as Ameriquest. In this excellent read, author Michael Hudson uses the rise and fall of Ameriquest and Lehman to tell the story of the industry that helped bring about a global crisis. Lane, Randall. 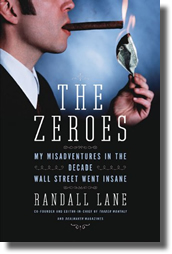 The zeroes : my misadventures in the decade Wall Street went insane. Portfolio, 2010. Founder and editor-in-chief of Trader Monthly and Dealmaker magazines, Randall Lane, tells his company’s boom and bust story, with Wall Street’s mania and reckoning running in the background. This engrossing story of greed and excess, of power and ego, flies high on wealth and materialism, but comes down in a crash with the 2008 Wall Street meltdown at the end. The story begins in 2004 when Lane and partner Magnus Greaves launch Trader Monthly, a glossy magazine for, and about Wall Street traders. A typical trader is a man under 30 earning $400,000 a year and spending all of it. These men care deeply about who has the fastest car, the biggest watch and the most expensive vodka. Trader Monthly treats these men as celebrities, displaying their vast wealth and boosting their egos. Luxury goods advertisers like Gulfstream, Maybach and Bulgari are delighted with the marketing opportunities. While his company generates few profits, Lane becomes a financial industry insider, rubbing elbows with the rich and powerful. He sponsors outrageous events to create buzz for his company. As the economy sours, he uses personal funds to bolster his company. By 2008 he is unable to sell his company and his personal savings are depleted. As the book ends, he has little to show for the decade, except this most entertaining story. © Reviewer : Meg Trauner & Ford Library – Fuqua School of Business. Johnson, Simon. 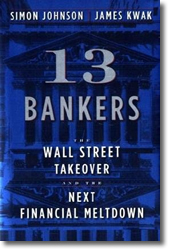 13 bankers : the Wall Street takeover and the next financial meltdown. Pantheon Books, 2010. 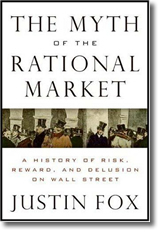 Since the economic crisis of 2008, dozens of new books have been written about the meltdown, some of them reviewed in this blog. In this important new work, the authors show how the financial sector and its political influence are a serious risk to the economic well-being of the global economy. The top six banks together control assets amounting to 60 percent of the U.S. GDP. These top tier financial institutions, including Bank of America, JPMorgan Chase and Goldman Sachs, are too big and too important to fail. The financial crisis made them even bigger, enlarging their market shares in derivatives, mortgages and credit cards. Yet these banks continue to take enormous risks, knowing that the government will shelter them from harm in a downturn. Significant change is needed to address the disproportionate wealth and power in these large banks. To return to a healthy balance in our economy, the authors recommend that banks be “busted,” such that each bank is no more than 4% of U.S. GDP, with investment banks having a lower limit of 2%. Banks could then be allowed to fail without threatening the entire economy. Reckless borrowing and lending would cease and the boom/bust cycles would end. Taxpayers could stop subsidizing wealthy bankers through bailouts. Author Simon Johnson was formerly chief economist at the International Monetary Fund. He was a faculty member at Fuqua School 1991-97, and currently teaches at MIT’s Sloan School of Management. Wessel, David. 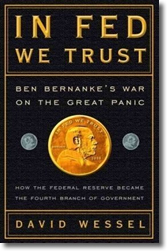 In Fed we trust : Ben Bernanke’s war on the great panic. Crown Business, 2009. A veteran editor of the Wall Street Journal tells a vivid tale of the people and events surrounding the Great Panic of 2008. The book opens in September 2008 with the question of what to do about Lehmann Brothers. Federal Reserve Chair Ben Bernanke, a scholar of the Great Depression, is convinced that the economic catastrophe from the 1930’s was the fault of the Federal Reserve. Yet Lehmann is allowed to fail, becoming the largest bankruptcy in U.S. history, and setting off a worldwide financial collapse. According to Wessel, from that moment Bernanke vowed to do whatever it takes to avoid Depression 2.0. Under Bernanke’s leadership, the Fed spearheads the largest government intervention in 50 years and is directly accountable to no one. This book is a behind-the-scenes look at the recent financial crisis and the Feds unprecedented response, as policymakers play by ear to keep liquidity flowing. This gripping story shows how decisions were made in this key moment in financial history. Earlier this fall, WRDS changed the procedure some users must follow to access data sets on the WRDS site. This change has caused some confusion for users, and so we’ve created an entry in our FAQ to address the issue. Please read the FAQ entry on accessing WRDS, and let us know if you have any questions. 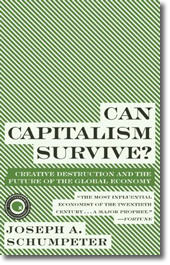 Book Review: Can Capitalism Survive? Schumpeter, Joseph A. Can capitalism survive? : creative destruction and the future of the global economy. Harper Perennial, 2009. A role of economists is to provide economic analysis of recessions such as the current one created by the financial crisis and provide strategies for restoring economic growth and prosperity. Leading up to the current recession, The Federal Reserve lowered interest rates to make housing more affordable, and Fannie Mae and Freddie Mac developed a federal program enabling people to qualify for homes that ordinarily would not. Subsequently, people purchased homes they could not afford and some lost their jobs due to the recession. Wall Street banks invested too heavily in risky loans rather than diversifying, accumulating toxic assets leading to tremendous losses. Hayek goes as far to say that central banking destabilizes the economy. In the recent recession, government intervention led to inflation, over building, a housing bubble, and then economic indicators became unrealistic. In addition to the destabilized housing market, the financial crisis had a ripple effect on travel, retail, the automobile and oil industries, and led to significant number of lost jobs.